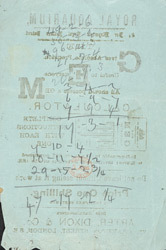 A series of sums is written on this reverse side the of a calculator advert. Perhaps Evanion was trying out the machine in the shop and testing its accuracy. The first mechanical calculator was invented in the 17th century by John Napier. Known as Napier’s Bones, it used a system of multiplication tables written in columns on different sticks, which could be referenced against one another to complete simple arithmetical functions. In 1874 a Swiss engineer, WT Odhner, invented a calculator based on the pin-wheel principal, much like the one advertised here. It had nine retractable pins, representing the first nine integers, which extended radially around a circular disc. The required number of pins were extended or retracted by a setting mechanism, generally operated by rotary levers. The extended pins acted as gear teeth to advance a register by the corresponding number of digits on rotation. Addition and subtraction were performed directly, while multiplication and division were accomplished by simple procedures involving additions or subtractions, and manual carriage shifts. All calculators were based on this system until introduction of electronic machines in the 1960s.